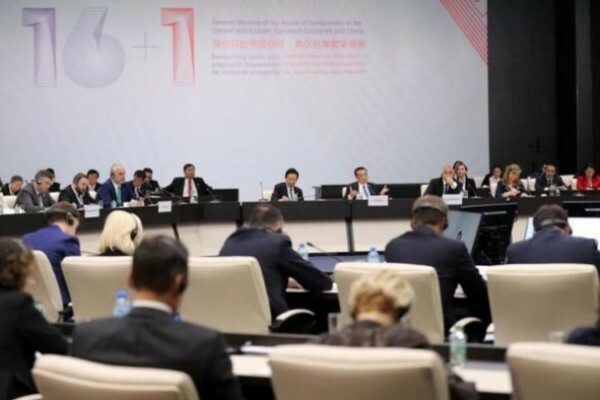 SOFIA – The need for enhancing 16+1 cooperation was highlighted as leaders from China and 16 Central and Eastern European Countries (CEEC) gathered in Sofia to discuss the future of the cross-regional cooperation framework. At the 7th meeting of heads of government of China and the CEEC on Saturday, Chinese Premier Li Keqiang put forward proposals to draw up a blueprint for the 16+1 cooperation, calling for deepening open and pragmatic cooperation between China and the CEEC to promote common prosperity and development. "As long as we insist on pursuing open cooperation, mutual benefit and win-win result, while staying down-to-earth with firm confidence, the 16+1 cooperation will surely be promoted steadily and it will add greater contributions to the development of China-European Union (EU) ties and the world's openness and prosperity," said Li at the meeting. It was the first visit to Bulgaria by a Chinese premier in 18 years. The theme of the meeting was "deepening open and pragmatic cooperation for inclusive prosperity." Li proposed both sides jointly safeguard economic globalization and free trade, maintain a rules-based multilateral trading system, oppose unilateralism and protectionism, and vigorously promote trade and investment liberalization and facilitation. He suggested more CEE countries participate in the construction of various forms of industrial parks according to their own advantages, and foster fresh force for innovation cooperation. Financial cooperation should be enhanced to open up more investment and financing channels for the 16+1 cooperation to solve financing difficulties, according to Li. He invited CEEC financial institutions to launch branch offices in China for business. The premier also called for upgrading local cooperation and stepping up cultural and people-to-people exchanges between the two sides. The CEEC leaders fully acknowledged the fruitful achievements of the 16+1 cooperation and spoke positively of the cooperation initiatives proposed by Li. The outcomes of 16+1 cooperation achieved in the past six years have exceeded expectation, as the trade volume between China and the CEEC grew to almost US$70 billion from US$40 billion. China's accumulated investment has reached nearly 10 billion dollars while the CEEC have invested more than US$1.4 billion in China. On Saturday, China and CEEC jointly issued a guideline for their cooperation, and the leaders witnessed the signing of more than 20 cooperation documents. Li and Bulgarian Prime Minister Boyko Borissov also unveiled the China-CEEC agricultural demonstration zone. At a flurry of diplomatic events in Sofia, including the China-CEEC meeting and a business forum, Li reiterated that the 16+1 cooperation, which includes both EU and non-EU members, is an open, transparent and inclusive platform. China is not geopolitically motivated in promoting its cooperation with the CEE countries, said Li when addressing the 8th China-CEEC business forum. Li said the 16+1 cooperation mechanism not only is conducive to the development of the two sides, but also helps narrow the gaps within the EU for balanced development and advancement of the European integration, underscoring that the 16+1 cooperation conforms to overall interests of Europe. He said the 16+1 cooperation always follows common international rules, including the World Trade Organization regulations, and relevant EU legal and regulatory framework. Moreover, China upholds that the 16+1 cooperation should be conducted on the principle of extensive consultation, joint contribution and shared benefits, while enterprises are required to participate in bidding for European projects in accordance with market regulations and business rules, he said. All parties agreed that the 16+1 cooperation is not a geopolitical tool, but a pragmatic cooperation platform where cooperation is carried out in accordance with EU rules. It will benefit both China and the CEEC and facilitate Europe's integration process, thus being conducive to strengthening rather than weakening the EU. During his stay in Sofia, Li also met respectively with several leaders from the CEE countries, and they agreed to enhance cooperation in various fields. Latvian Prime Minister Maris Kucinskis said in the meeting with Li that Latvia is China's reliable friend and is willing to work with China to continue enhancing cooperation in scientific and technological innovation as well as in research and development. The Czech Republic is ready to improve the level of trade and investment cooperation with China, and it hopes to take part in the first China International Import Expo and will continue to actively participate in the 16+1 cooperation, said Czech Prime Minister Andrej Babis. Romanian Prime Minister Viorica Dancila said Romania welcomes China's investment in its infrastructure construction, noting that Romania will continue to optimize its legal and policy environment. She also welcomed more Chinese tourists to visit Romania. Romania will assume the rotating presidency of the EU next year and hopes to continue to play an active role in advancing China-EU ties and the 16+1 cooperation, said Dancila. The CEEC leaders also voiced the expectations to cement cooperation at the China-CEEC meeting. They expressed their willingness to continue to uphold the notion of open cooperation, equal consultation, mutual benefit and win-win cooperation, strengthen cooperation in the areas of economy, trade, investment, transportation, energy, tourism, education, and between local areas to maintain multilateralism and free trade, and oppose protectionism, so as to promote the 16+1 cooperation for new progress.